Nivetha is a member of the Class of 2018. After contributing "A Journey into the World of 3-D Printing" during her freshman year, she joined the staff of the Green Wave Gazette during her sophomore year. 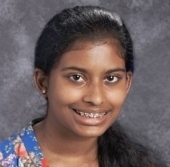 Nivetha enjoys writing about world news, technology, and school events. Her other interests include playing the piano and volunteering. Nivetha hopes you enjoy all the great articles in the Green Wave Gazette.